If George Lucas and J.R.R. Tolkien had collaborated on a film, it might have resembled Krull, a sci-fi-fantasy hybrid that borrows liberally from both Star Wars and The Lord Of The Rings. Written for the screen by Stanford Sherman, the film concerns Colwyn (Ken Marshall), a Skywalker-ish prince with an immaculately groomed beard who marries Princess Lyssa (Lysette Anthony) and then loses her when she’s kidnapped by the Beast, a globe-trotting monster with an army of spiky-armored Slayers who wield spears that shoot laser beams. Left for dead, Colwyn is nursed back to health by a wise Obi-Wan Kenobi-style sage named Ynyr (Freddie Jones), who comes down from his mountain home to join Colwyn as he endeavors to save Lyssa. That mission necessitates first locating the Beast’s location-hopping spaceship castle known as The Black Fortress, and soon finds him teaming up with a skinny shape-shifter named Ergo The Magnificent (David Battley) who functions as the story’s de facto C-3PO, as well as some bandits (including a young Liam Neeson and Robbie Coltrane) and a Cyclops named Rell (Bernard Bresslaw). Colwyn’s adventure leads to encounters with blind seers and giant spiders, and trips through misty swamps, up treacherous crags, and across vast plains while astride magical fire steeds. It also, crucially, involves a magical five-bladed boomerang-ish weapon known as the “Glaive” that only Colwyn can obtain and use (à la King Arthur), and which is the key to killing the Beast. If it’s all more than a bit silly, not to mention derivative, Krull manages to cast a fantastical spell courtesy of Peter Yates’ direction. Shooting on a variety of elaborate sets that benefit from the fact that they all look more than a bit artificial—and thus unreal—Yates uses his widescreen frame to create consistently eerie and unsettling vistas of otherworldly dread and wonder. While his action sequences are occasionally stilted, his assured visuals help elevate the film above its Lucas-knock-off brethren. And in its conception of the Beast’s lair as a borderline-abstract environment akin to the villain’s body (with Lyssa trapped in his eye, his chest cavity, and his heart), the film strikes a near-perfect balance between the hallucinatory and the cheesy. 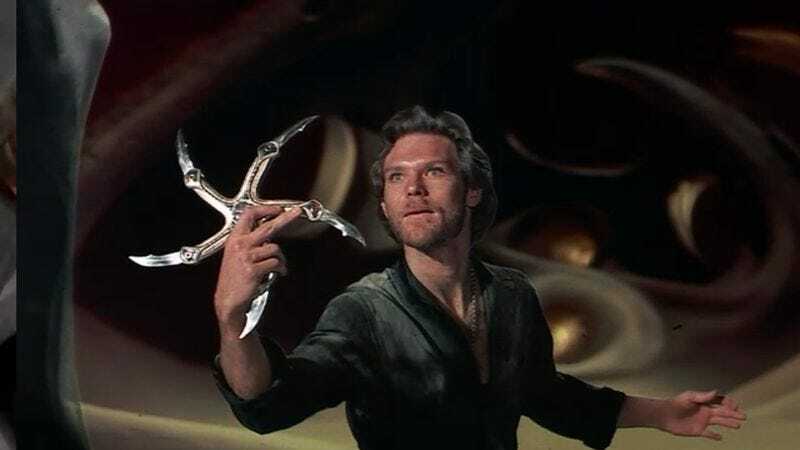 Availability: Krull is available on Blu-ray and DVD from Netflix or possibly your local video store/library. It can also be rented or purchased from the major digital services.